Pro football is now inseparable from the seventh day. It wasn’t always so. 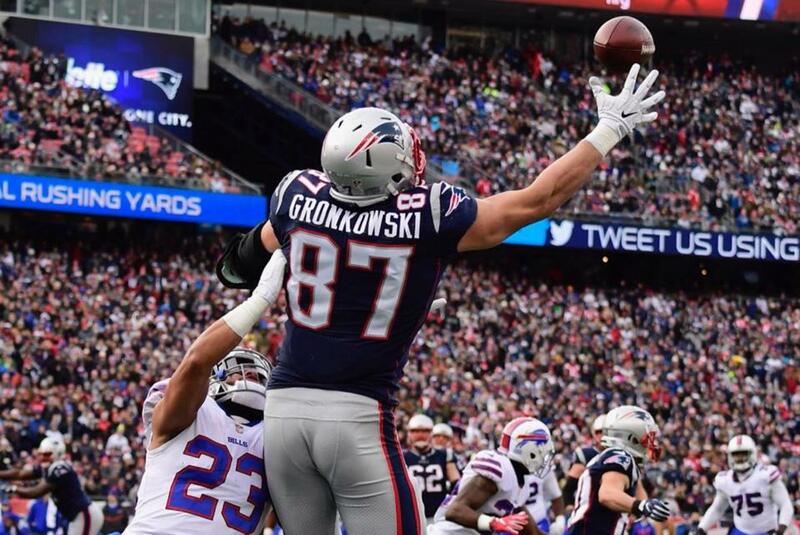 Rob Gronkowski makes a touchdown catch against the Buffalo Bills. Super Bowl Sunday is such a familiar part of the American cultural landscape that it might seem silly to ask how the Super Bowl — and professional football in general — ever came to be played on Sunday in the first place. But rewind the clock far enough, and the juxtaposition would be shocking. To the Puritans who helped found the nation, Sunday was the Sabbath (divinely transferred from Saturday). In their minds, the Sabbath’s prohibition on work extended to play as well. How did that change? Super Bowl Sunday — and the consecration of fall Sundays to the NFL more generally — was in a sense the result of a long argument over Sunday play in America that extended from Colonial times all the way to the 1920s. By then, America had become home to many generations of immigrants who belonged to Christian denominations that were far more open to the idea of Sunday recreation. Their influence, plus the emergence of newly positive attitudes toward sport in general, helped to end national debate over Sunday sport — paving the way for pro football on Sunday, and eventually leading to the Super Bowl becoming the nation’s biggest shared spectacle. These days it has become commonplace to joke about Super Bowl Sunday being an American holy day, but the story of Sunday football suggests that there’s more than a little truth to that notion. The Super Bowl does not occur on Sunday coincidentally, or in spite of it being Sunday, but precisely because Sundays in general were holy to so many Americans — and because sports, in a peculiarly American fashion, worked their way into religion itself. Early pro football leagues, made up mostly of factory workers, played not on Sundays but on Saturdays, like college teams. But they couldn’t compete with college football — a sport that was then more popular than the professional game — and the early leagues folded fast. 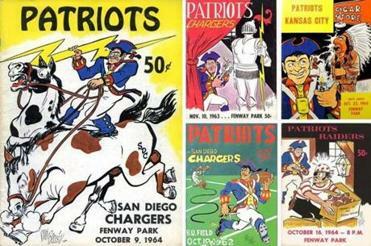 A designer compares the AFL’s quirky early visuals to today’s slick branding. Right around the end of World War I, however, a new league in the Midwest, which would become the NFL, had the novel idea to try Sunday instead. Some professional baseball teams had played on Sunday for decades, from the time they realized that they drew their biggest crowds that day. The new NFL decided to imitate them, and the crowds began to grow, even though they remained smaller than college crowds until the 1950s. Still, even those fans who liked Sunday play weren’t so sure about professional sports moving into their sacred day. Not all fans and players belonged to churches, of course, but many did. Without their approval, there would have been no pro sports on Sunday. For some time, however, a curious alliance had been growing between sports and American religion. By 1900, more and more Christian leaders were mixing sport into a religious message, often called “Muscular Christianity.” These leaders were beginning to do to sports what had been done to so many other nonreligious rituals over the millennia: They “sacralized” them, taking something once seen as profane into the realm of the sacred. In this conception, Jesus was held up not merely as a perfect spiritual leader, but as a perfect physical specimen and the “captain of the team.” During World War I, professional baseball teams started to play the National Anthem before games, lending the sport the sanctity of a new civic religion — which in the minds of many Americans wasn’t entirely separate from traditional religion, anyway. Some sports fans even saw the games as a form of prayer in themselves. In the 1930s, Father John O’Hara, president of Notre Dame, called Notre Dame football a “new crusade” which showed that “play can be offered as a prayer in honor of the Queen of Peace.” And Jesse Harper, who coached the Notre Dame football team from 1913 to 1917, claimed that he got the play known as the “Notre Dame shift” from Amos Alonzo Stagg — who was said to have gotten it from God. The growth of Sunday sport didn’t occur everywhere at once. Leading the way was the Midwest, where a largely Catholic and non-Puritan Protestant population had few qualms about Sunday recreation after church. The Northeast accepted Sunday sport more slowly, thanks to its Puritan roots, but most opposition faded before World War II. The South, relatively relaxed on Sunday in the nation’s early years, was relatively stricter by the 1920s and was thus the last holdout: Pro teams emerged there only in the 1960s. In a sense, by accepting Sunday football, America was simply joining a long thread in human history. Most ancient civilizations celebrated their holiest days with some form of sport — played not merely for fun, but to reenact the great cosmic struggle of good versus evil, right versus wrong, even life and death. Go to any pro football game today and you’ll find the cosmic struggle on full display. The ecstasy and crying and anger (not all of it beer-induced) show that fans are there for something more meaningful than fun, something that can feel more important than their jobs or daily lives. They want to see an enactment of some of our society’s highest values — courage, cleverness, skill — and, most of all, to experience the vicarious thrill of victory. Today Sunday football in America is widely entrenched, and Super Bowl Sunday most of all. On that day, some churches put a giant television right in the middle of the building and hold a “holy huddle,” a “pre-game prayer,” a cheer, and a pep talk with the “team owner”: Jesus. However they may understand the connection between football and godliness, it’s clear that what they’re celebrating is a holy day. Craig Harline is a professor of history at Brigham Young University and the author of “Sunday: A History of the First Day from Babylonia to the Super Bowl,” recently released in paperback by Yale University Press.